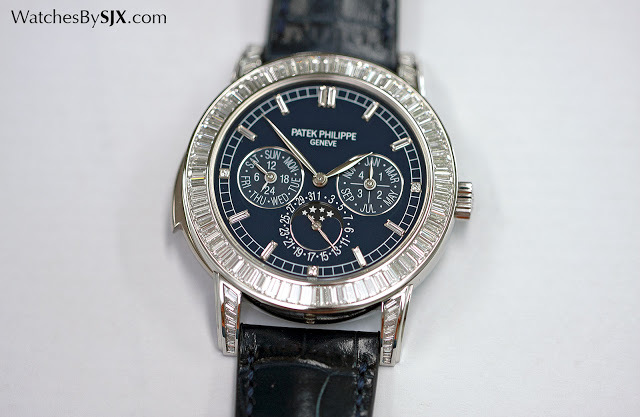 One of the most extravagant Patek Philippe grand complications, the Ref. 5073P is a minute repeater with perpetual calendar, and over four carats of baguette-cut diamonds. While its cousin without diamonds, the Ref. 5074P, is somewhat stealthy, the Ref. 5073P is unashamedly loud. The bezel, lugs and dial are set with large, baguette-cut diamonds, making the 42 mm case, already large by Patek Philippe standards, seem even larger. There is an undeniable, elemental appeal in a highly complicated watch with a gorgeously finished movement, that also happens to be extravagantly lavish. Naturally the minute repeater is loud as well, though not as loud as the equivalent in gold. That’s down to the case made of platinum, which is more dense than gold. This particular model is the ref. 5073P-010, introduced only last year. 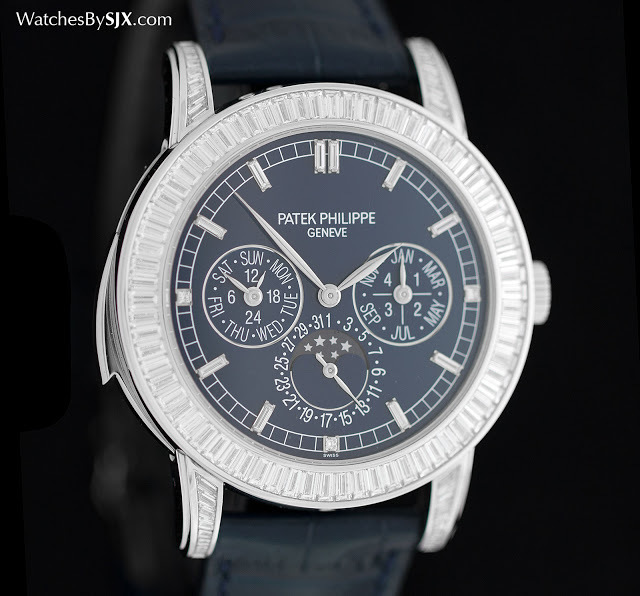 Historically Patek Philippe grand complications in platinum with diamonds were matched with black dials, this is one of the few with a dark blue dial. The R 27 Q movement is self-winding, and is equipped with cathedral gongs. Unlike ordinary minute repeater gongs that circle the movement once, cathedral gongs are much longer, almost twice as long as the circumference of the movement. This gives the chimes a deeper tone with longer resonance, though critics argue cathedral gongs tend to sound more muted. Here’s a clip of the ref. 5074P with the very same movement in action. Typical of a Patek Philippe grand complication the movement finishing is exemplary, acquitting itself well even up close. That being said, there is less to admire here as compared to a manually-wound repeater movement (like that in the more complicated ref. 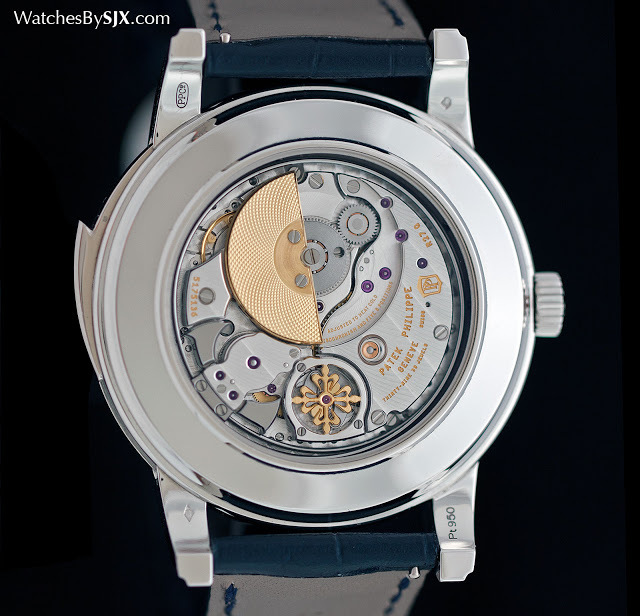 5016), since the gold rotor occupies a third of the movement. 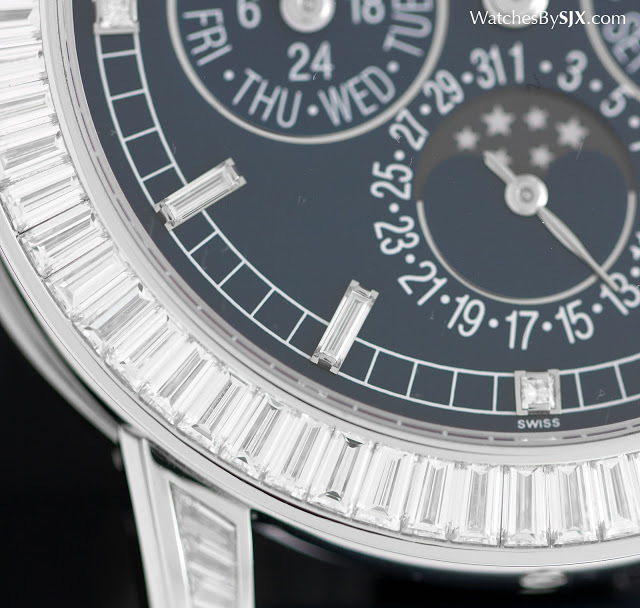 For more Patek Philippe eye candy, check out our story on the ref. 5370P split-seconds chronograph. The most complicated, integrated chronograph made by Patek Philippe, the ref. 5951P is compact but offers much to admire. 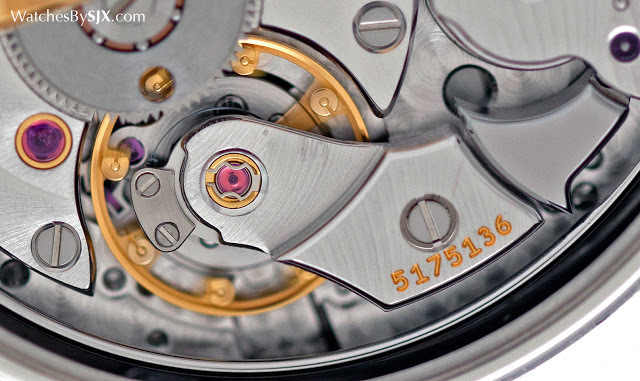 We go up close with it, complete with detailed photographs of the movement. One of the most complicated timepieces Patek Philippe makes, the Ref. 5207P combines a minute repeater, instantaneous perpetual calendar as well as a tourbillon, inside a platinum case with hand-engraving on its flanks. The Ref. 5207P really is a grand complication.